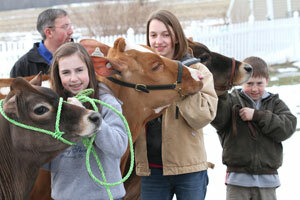 Raising and showing dairy cows is a big part of the Mazzaro family’s life. Tom and his wife, Charity, live on a 5-acre spread in Williamsfield, Ohio, with their four kids. From spring to fall, they’re often on the road, heading to the next show or county fair. Tom, who majored in dairy science at Ohio State University, also earns his living artificially inseminating dairy cows for area farmers. 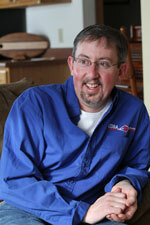 More than nine years ago, Tom underwent heart surgery at Akron Children’s Hospital to repair a congenital heart defect. Since then, Tom, age 40, hasn’t had any problems keeping up with his kids – Bailee, 14, Calla, 13, Mason, 10, and Matthew, 5 – or the family’s three heifers, Guinevere, Isabelle and Stella. But that wasn’t the case during the six months leading up to the surgery. “I was so physically exhausted by the time I got home from work, I could barely stay awake at the dinner table,” Tom said. As a teen, Tom was diagnosed with a congenital heart defect known as bicuspid aortic valve, meaning his aortic valve only has two leaflets instead of the normal three. In addition, his bicuspid aortic valve leaked severely, causing the left ventricle of his heart to work harder than necessary. When the defect began affecting Tom’s quality of life, John Lane, MD, director of Akron Children’s Adult Congenital Heart Service, knew it was time to intervene. Dr. Lane consulted with cardiovascular surgeons Philip Smith, MD, PhD, and Michael Spector, MD, who repaired Tom’s aortic valve. His only ongoing treatment is an annual check-up with Dr. Lane and daily medication for high blood pressure. “As far as the surgery, I’d do it all over again to feel this good,” said Tom. In 2007, Tom shared his story in this video.